Apricot was created in 2007 with the aim of creating a woman's clothing brand that features new, unique trends at low prices. All clothing and accessories sold by the company are created using in-house designs with fabrics that have been sourced and inspired from countries all over the world. The collections that are created by the brand have been produced to appeal to women of all ages, from mother to daughter, and all occasions, from high street to late night parties, and even limited edition fashion pieces. Use our Apricot discount code now to get an even better deal! Purchase the best collection of dresses, tops and much more at apricotonline.co.uk. Get them delivered to your doorstep for free when you spend over £50. Apricot is well known for featuring prints and patterns from all over the world, this look becoming a signature design that stands out from the crowd. This, partnered with their key aim of providing an excellent shopping experience, both in the shops and online, make the brand very successful. 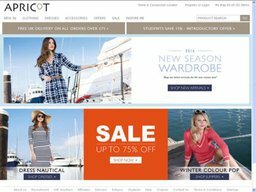 As well as being sold on the high-street, Apricot online allows customers the ability to browse and shop from the comfort of their own home, getting a whole new wardrobe without the hassle of leaving home, and with plenty of opportunities to use an Apricot clothing discount code, you could even save money. Although Apricot is based in London, there are over 500+ places to purchase this clothing within the UK and Ireland, 12 of these being stand alone stores. There is also over 200 concession locations outside of the UK and Ireland. The brand can also be found in host stores such as New Look, House of Fraser, Debenhams, Beales, Outfit & House, and a range of independent stores. Apricot provides a great shopping experience for its customers by providing them with huge opportunities to save money. Products are regularly on sale throughout the year, with huge a Apricot clothing sale, but especially in January and in Summer. The brand also regularly offers multi-buy deals and codes that can be redeemed to save more money. If you don't know where your nearest store is, their online store features a very handy store finder tool. Simply type your location into the search bar, and the nearest stores or concessions to you will show up on the map. When you search for Apricot coupons and offers, you should expect to find the following. Some of these can be found on the Apricot clothing sale or online, while other voucher codes for Apricot clothing can be found right here on BargainFox. Bear in mind that some of the offers are only available at certain points throughout the year, so be sure to check this before using it. How to get your money off! It is so simple to use a discount code with Apricot, so if you have one that you want to use, just follow these easy steps to start saving money! When you find a code that you wan to use, got the the Apricot online website to view the countless clothes and accessories that they offer. Once you find the items that you want to buy, add them to your basket. When you have finished shopping, click on the 'My Basket tab', this will take you to a page with all of your items in. At the bottom left of the page, a box is provided for you to enter the promo code. Type or copy the code into the box and then clock on the 'Apply' button to activate it. This will automatically apply the discount to your total, and then you can continue with the process to pay as normal. Although the brand is based in London, Apricot offers both UK and international delivery, the cost of this delivery depends on the delivery country. For UK deliveries, you can choose between standard delivery, which is charged at the set price of £3.99 and is estimated at arriving within 3-5 working days. Or next day delivery, which is set at the price of £7.99. However if you spend more that £75 when shopping online, the company offers free standard delivery. He rest of Europe is charge at 13.73 Euros, and the estimated delivery time is only 3-5 working days. For delivery to Germany, it is priced at only 9.98 Euros, and the USA at $22.38. The Apricot returns policy depends on how you have chosen to shop with them, as they differ if you have shopped online, in a stand alone store or in an Apricot concession. When the item is returned, it will be inspected by a team at the warehouse, and if it is in it's original condition, and not worn, washed or any labels missing, your refund will be received within 21 days, by the original payment method. Your items can only be returned within 28 days of receiving your package, and you must be sure to include your order number, full name, barcode number of the item(s) being returned and the reason code(s) for return on the returns form. If possible, repackage your item in the original packaging, and apply the returns label. If you purchases items from a stand alone store, simply return the item to your nearest store within 28 days, along with your receipt. If bought from a concession store, the items will need to be returned to the same store. If Apricot isn't enough to get you your fashion fix, we also have some great discount codes for H&M.